Jeremiah Wright was on Bill Moyers Journal tonight. It was such a fluffpiece that you kept thinking they might kiss. Anyway… Moyers was able to accidentally do us all a favor and settle the “Wright’s hateful words were cherry-picked” argument. Moyers aired the whole America-hating sermon of Wright G-damning America. It’s getting hard to look at Barack Obama and wonder what was going through his head for 20 years while he sat and listened to that filth. It would be difficult to see someone like that as president. Wright’s Trinity United Church of Christ focuses on Black Liberation Theology. 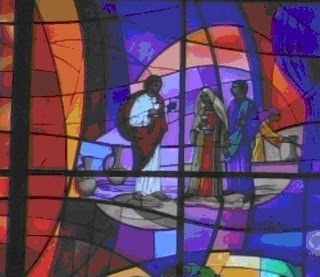 The windows of the church display different characters of the Bible. Here is black Moses? Or, St. Peter? And, here a black Jesus(?) turning water into wine. 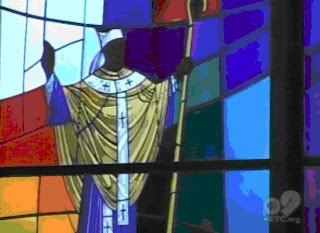 The church is so focused on race that even the Bible characters are all black at Trinity. UPDATE: Karl says Moyers played whiffleball with Wright. Richard Landes takes apart Wright’s black liberation teachings.